Note: New and improved design. The new Dr Foot Gel Plus Insoles have a firm support with softer blue area in the heel and forefoot giving enhanced cushioning to these targeted sensitive areas. The Gel Plus is ideal in all types of footwear used in high-impact activities. The Dual Gel Shock Modules provide extraordinary protection for the two major impact zones, the HEEL and FOREFOOT. They also feature an arch support to prevent overpronation (rolling over of the feet) which can cause problems such as heel, arch, back and leg pain. These remarkable dual-density gel insoles doubles the cushioning where feet need it the most - at the heel and metatarsal area. 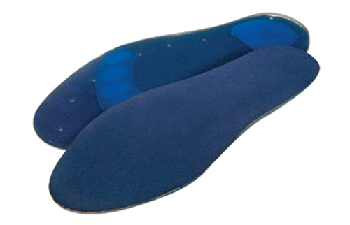 So if you suffer from Achilles pain then use these insoles to prevent overpronation and cushion the heel and forefoot for extra comfort.